The Aerobie Epic Golf Disc is a long-range disc golf driver! This flying disc is known for its astounding distance, and tomahawk throws. The patented epicyclic design of the rim is narrow on one side for a better grip and wider on the other side for executing long-range throws. Fun for practice and recreational games. Approved by the Professional Disc Golf Association (PDGA). Approximately 8.4 inches in diameter. Available in assorted colors. Sold individually. Ages 13+. 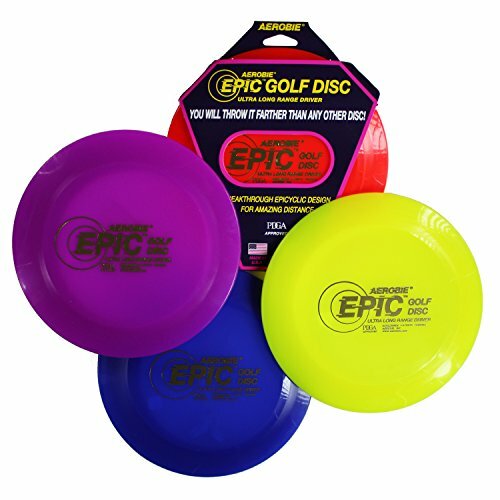 The Aerobie Epic Golf Disc is a disc golf driver that delivers astounding long-distance throws! The patented epicyclic rim is thinner on one side for a better grip and wider on the other side for executing long-range throws. Fun for practice and recreational games.